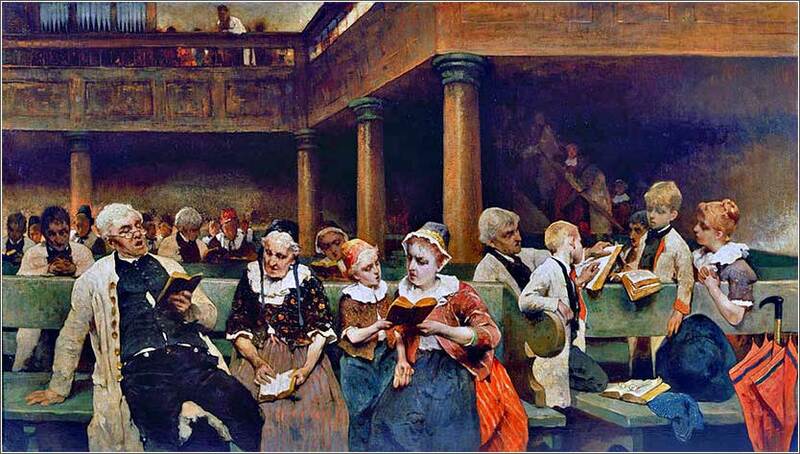 The Sunday School Class by Isaac Mayer, ca. 1870. 545 people in our community are currently praying with you. Lyrics to "Teach Me to Walk in the Light"
In the morning when I rise, I give praise to my God, who shows His glory in the sun. O Lord God, you are the source of all warmth, all light, all sustenance. You brings us out of the darkness of ignorance and the blindness of death every day, that we might remember who made us and who sustains us. Your sun is a promise, that the night of death will end and you will rise again, and with you, all who confess the name of your blessed Son, Christ Jesus. Let me remember you when I rise and all the day, my God, every waking moment; and let me sleep each night in peace, confident that I will rise with your sun once again, in the time you have chosen for me. I delight to do thy will, O my God: thy law is within my heart. O Almighty Lord, and everlasting God, I beseech you to direct, sanctify, and govern both my heart and body, in the ways of your laws, and in the works of your commandments; that, through your most mighty protection, both here and ever, I may be preserved in body and soul; through our Lord and Saviour Jesus Christ. Jacob and the Angel by Giordano Luca, ca. 1694. I wonder how Jacob would have fared wrestling with prepositions in Pauline epistles. We ended last Friday talking about prepositions — a riveting subject that never fails to set hearts a-flutter. But they become really important when one reads Paul, starting with today's verses. It will become critical in later chapters. Take this quote from Ch. 2: “For through the Law I died to the Law, so that I might live to God. . . . it is no longer I who live, but Christ lives in me; and the life which I now live in the flesh I live by faith in the Son of God . . . .” (Gal. 2:19-20, NASB) Most people reading this, I think, just throw up their hands and settle for some sort of general understanding that Paul is living a new Christ-centered life. And the primary obstacle to fuller understanding is . . . prepositions. e are often forced to simply ignore a preposition and try to puzzle out the meaning of Paul's writing from context and comparison to other passages. This leads to a tricky translation process. We don't want to end up supplying the meaning we want a passage to have, rather than reading what Paul actually meant to say. Fortunately, today's Scripture gives us an easier example of how Paul used prepositions, to get us started. Gal. 1:16 tells us that Christ was revealed “in” Paul and “through” Paul “to” the Gentiles. 1) Christ was revealed in Paul. Paul himself was a living revelation of Christ, physical proof of the power of Christ to transform us. His sudden change from a Christian-hunting agent of the Sanhedrin to the exact opposite, the foremost proponent of Christianity, is so sudden, so unexpected, and so radical, that it is inexplicable without accepting the intervention of God. This Spirit who changed Paul is literally inside him; it proves itself by his words and deeds. 2) Christ was revealed “through” Paul. Here, we understand that Paul spoke (and wrote) as a conduit to God. Christ speaks through him in much the same way Yahweh spoke through the prophets. We say that an announcer speaks through a public address system, or the President speaks through his information officer. The analogies are not perfect, because Paul's personality and voice remain his own; he does not become a God-puppet, but a God-inspired man. The words are his, but nevertheless, the message is God's: utterly true, infallibly true, eternally true. “to” the Gentiles — identifying the audience of Paul's gospel. “among” the Gentiles — telling us where (and by implication, to whom) Paul will preach. The larger meaning is pretty much the same in all three cases, just with a difference in emphasis. If the Bible is ambiguous, we might infer — perhaps we must infer — that God means us to accept an ambiguity. But for certain, to attempt to correct the Bible by supplying a clear meaning where the Bible itself does not is not simply error, but serious error. (Gal. 1:6-9) This is the fundamental error of most systematic theology.